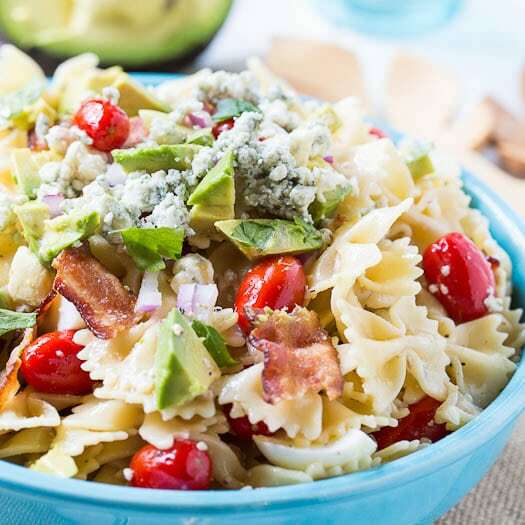 This fun pasta salad has all the ingredients of a Cobb Salad: bacon, tomatoes, hard-boiled egg, blue cheese, and avocado. Pasta Salads are one of my favorite dishes to play around with as far as ingredients and flavors go. There’s no need to always make the same old boring pasta salad with Italian dressing. I adore the flavors of a cobb salad and loved using them in a potato salad, so I decided to try them in a pasta salad. It was easy and delicious, packed full of so many complimentary flavors. I started with 1 pound of pasta cooked to al dente. Any shape will do, but I really like farfalle. Then I added some blue cheese vinaigrette. I used La Martinique Blue Cheese Vinaigrette Dressing which is one of my favorite dressings to use on salads and one of only a few bottled dressings that I really like. I only mix about half the dressing in at this point and save the rest for tossing on just before serving. That way the pasta has a chance to really soak up some flavor, but you still have your pasta nicely coated with dressing. Add some red onion, grape tomatoes, hard-boiled eggs, bacon, blue cheese crumbles, and my very favorite- AVOCADO! All the wonderful flavors of a cobb salad are here. You could toss in some roasted chicken and make a full meal out of it. I love that during the hot summer months the definition of what constitutes a meal gets a little more lax. Everyone expects a huge meal in the fall and winter with a protein, at least a couple of sides, and some type of bread. But during the summer I’m perfectly content with a light salad or even a couple of hor d’oeuvres and a glass of wine for dinner. If you can’t find a blue cheese vinaigrette, try mixing together regular blue cheese dressing with an Italian Vinaigrette or add some oil and vinegar to the blue cheese dressing. This pasta salad has all the flavors of a cobb salad: tomatoes, hard-boiled eggs, bacon, blue cheese, and avocado. Cook Pasta until al dente and rinse under cool water. Drain and place in a large bowl. Toss with half the vinaigrette. Add red onion, tomatoes, and eggs. Refrigerate for at least 30 minutes. Just before serving mix in remaining vinaigrette, bacon, blue cheese crumbles, and avocado. Be sure to salt the pasta water well. I use around 1 tablespoon of salt. If you don't have a Blue Cheese Vinaigrette, try mixing together regular Blue Cheese Dressing and Italian Vinaigrette or just add some oil and vinegar to the Blue Cheese Dressing. 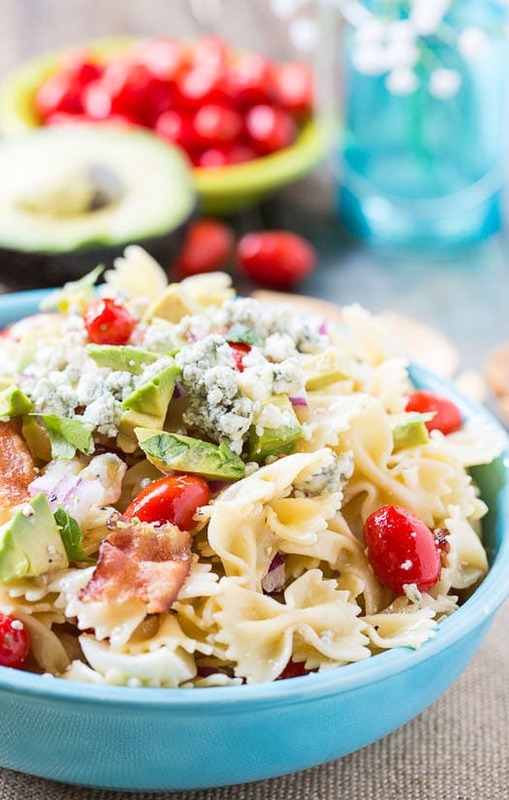 This entry was posted in Salads, Side Dishes and tagged avocado, bacon, blue cheese, pasta. Bookmark the permalink. I made this last weekend for a cool meal on a hot evening. I added cooked chicked to make it more of a main dish and used the La Matinique vinagrette, since I couldn’t find the blue cheese vinagrette. It was really delicious and made a large portion. So glad you enjoyed it Amy! I will have to add chicken next time I make it. That sounds like a great summer meal. ok, now just why didn’t I think of this idea? Looks delicious. Thanks for stopping by my blog and the comment and the best part about that is finding your site. I’m a new subscriber, as I can tell I’m going to find lots of great things here. Nice to meet you. This pasta salad sounds amazing! I’m loving all the different flavours and ingredients added! Oh I like this idea! Bacon anything makes it seem like summer time. Love it. This is totally my kind of salad! I love your version of a Cobb and the blue cheese. Your pasta salad looks absolutely mouth watering! 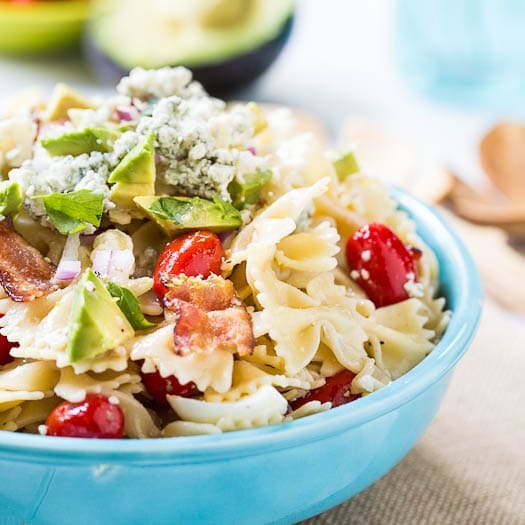 Love how you made it a “cobb” pasta salad! This looks SO good! I love pasta salads – I think I could devour the whole thing! One bowl Summer meals are my favorite…and this pasta dish is a delight! 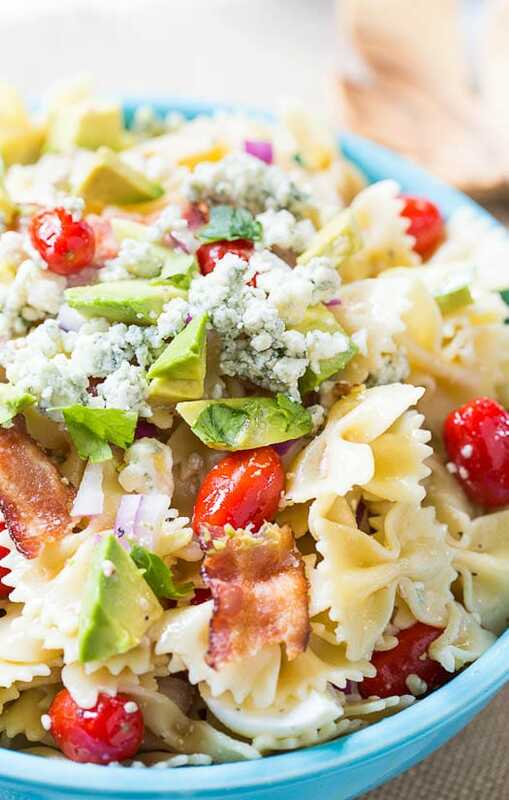 I love that you made a cobb salad into a pasta salad — great idea! It’s one of my favorite salads, and this would make one satisfying meal. The avocado totally makes it for me, too. 🙂 Have a great weekend, Christin! 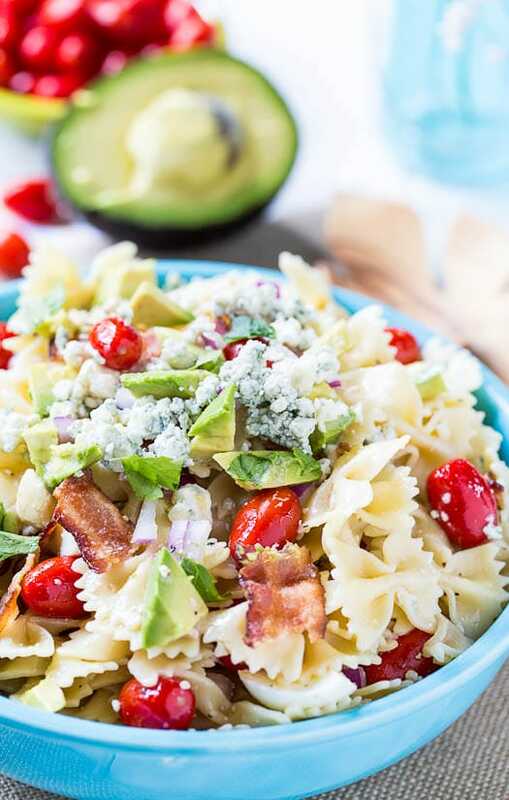 Anything with bacon, blue cheese, and avocado is tops on my list of favorite foods! It’s not even lunch time and this salad is making me so hungry! Awesome post, Christin! This pasta salad looks beautiful, Christin! This is my favorite type of salad, and I love experimenting with flavors, too! And I love that you made a cobb one…if I get regular salads, I often get the cobb, so I love that you combined the two! Pinned! I don’t make pasta salads that often.. but this one sounds really filling and delicious! I’m like you. I love getting creative with pasta salads! They are so much fun to play around with. I love your version, Christin! What a creative idea. Pinned and sharing on FB.